NOTE: All of the programs once again this month feature recordings that are part of the expanded Naxos Distribution family. 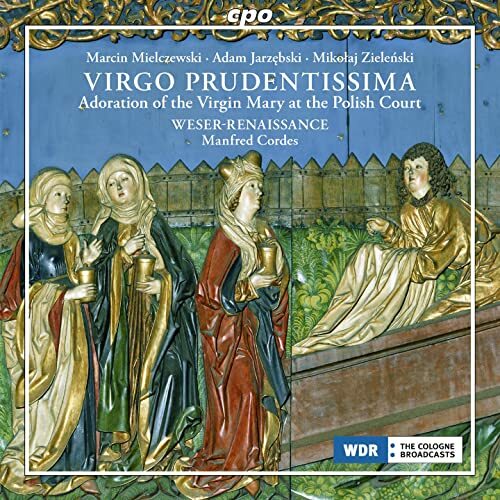 Including two superb new recordings celebrating the Renaissance masters at the Polish court. From Amazon.com: This enterprising programme paints a picture of early baroque music at the Polish Royal Chapel in Warsaw, at a time when the irresistible influence of the Italian `seconda prattica', pioneered by Claudio Monteverdi, was making itself felt throughout Europe. The Polish king Sigismund III Vasa (r. 1587-1632) very sensibly decided to supplement the existing royal ensemble with a number of Italian musicians; and from then on, for most of the 17th century, Polish and Italian musicians co-existed and flourished in court and church. The results of this fruitful collaboration, as the present CD shows, were both fascinating and beautiful. The three composers represented here are Marcin Mielczewski, Mikolaj Zieleñski and Adam Jarzêbski (no dates of birth known, but all died around 1650). The first two of these contribute vocal works, and the third provides the instrumental pieces. As is normally the case with the superb Weser-Renaissance Bremen early music ensemble, director Manfred Cordes tailors his group's personnel according to the needs of the music chosen. In fact he has an exceptional talent for collaring the finest early-music practitioners around and, appropriately for this recording, he has roped in several Polish musicians, both instrumental and vocal - of which the two sopranos, Magdalena Podkoscielna and Maria Skiba, make an especially distinguished contribution. So the ensemble here consists of eight voices, with sopranos and male altos taking the upper parts, as well as an instrumental group of strings, trombones, dulcian and continuo. Mielczewski's 13-part motet `Virgo prudentissima', unashamedly modelled on Monteverdi's wonderful `Sonata sopra Sancta Maria' from the 1610 Vespers, makes for a stunning opening. II. Argentum et Aurum—Musical Treasures from the Early Hapsburg Renaissance (Ensemble Leones/Marc Lewon). Naxos CD 8.573346. The period of the early Habsburgs, from c.1340 to c.1520, saw the development of a richly diverse musical culture in the Austrian region. This pioneering selection, the product of an extensive research project conducted at the University of Vienna, presents an overview of music in everyday life, in many cases in première recordings performed by Ensemble Leones. The music is sacred and secular, allowing the listener to eavesdrop on Tyrolean palaces, dance halls and bourgeois homes, and on the singer-poets who travelled the country where old local styles fused with the latest international fashions. III. Ortus de Polonia (Les Traversées Baroques/Etienne Meyer). K. 617 CD 248. From Amazon.com: Les Traversées Baroques continues its exploration of the great repertory of sacred music from northern Europe. After Marcin Mielczewski, the ensemble has decided to turn to Mikolaj Zielenski for its new recording, thus rehabilitating this Polish Baroque composer whose biography is no more than a long series of question marks, but whose magnificent music amply compensates for the gaps in our knowledge. Established in 2008 in Burgundy, Les Traversées Baroques dedicates its repertoire priorities toward the countries of Eastern Europe during the 17th c.
The Polish baroque composer Mikolaj Zielenski (c. 1550-1615) was writing at a time when European music - including a number of eminent German, Austrian and Polish composers - was changing dramatically under the influence of the Venetian school of the Gabrielis and their contemporaries. Many of these northern and central European musicians travelled to Italy to learn their craft. That influence pervades the contents of the present recording, consisting mainly of sacred vocal works by Zielenski (I'd like to use the strictly Polish spelling of his name but when I try, it gets misprinted by Amazon) but also a couple of pieces by Giovanni Gabrieli and one by Palestrina. The opening work, Zielenski's 'Ortus de Polonia', is distinctly Gabrielian in style, sung here by a pure-voiced choir with some lovely instrumental work from cornetti and others doubling and embellishing the vocal lines. The vocal ensemble Les Traversées Baroques, directed by Étienne Meyer, and the instrumentalists of Fiori Musicali, are all excellent, and there is a deeply devotional quality to both music and performances in these lovely, expressive pieces, further enhanced by plenty of enterprising instrumental work. 'Mitte manum tuam' (track 3) is a fine solo bass motet with cornetto part; 'In virtute tua, Domine' (4) is another lovely piece. Tracks 6 and 7 bring us two familiar Gabrieli works, the instrumental Canzon VIII and 'In ecclesiis' from the Sacrae Symphoniae. Zielenski's 'Gloria et divitiae' (14) is especially fine, and lovingly performed here. CPO CD 777 772-2, Naxos CD 8.573346, K. 617 CD 248.